Since I am interested in the effect of choice on student engagement, motivation, and perceptions of science, I will need to design a learning experience where my students have the opportunity to choose how to express their knowledge. A project fits this criteria perfectly. In this case, the project the students will create will be a presentation piece, such as a poster, powerpoint, or infographic that the students can use to demonstrate their understanding through visuals and text. They will not be required to give an oral presentation due to time constraints. This project is different from previous assessments used in this class because it is mainly student driven rather than teacher prescribed. Previous assessments have involved students answering multiple choice and short answer questions designed by the teacher and administered through worksheets, lab handouts, and exams. This project gives students a guideline on what content to include but leaves it to the students to decide how to present that content through choice of topic and media. We will start by spending a few days learning the content needed for the projects. Then students will be given a week to complete the project described below. After the project is completed they will be given a multiple choice exam in the same format they have had for previous units. Our current unit of study is thermochemistry, the study of heat flow in chemical reactions, and we mainly focus on discussing heat flow in different situations. The nature of this unit lends itself well to choice because there is a way to analyze heat flow in almost any situation, giving students the opportunity to choose a situation they are curious about. They will meet the objectives by defining the system (what part of the situation they are focusing on) and surroundings (everything outside of the system) in their chosen situation, categorizing it as endothermic (absorbing heat) or exothermic (releasing heat), depicting/describing the heat flow between the system and surroundings, and describing the movement on a molecular level (increasing temperature means increase in molecular motion). As determined from my literature review, my project design will include three facets: bounded choice, explicit expectations, and a rubric. The assignment guide for the project can be found here. Bounded choice refers to the idea of providing a set of options to help guide the students and get them started on a successful and manageable path with their projects. This idea will be incorporated into the structure of the student projects. Students will need to generate a research question for their project and make sure to include pertinent information from the unit as they answer their question. In the assignment guide I have included two menus to help students decide on their project topics: one for potential topics and another for potential project formats. Being explicit with expectations is important to reduce anxiety associated with having too much choice and not enough guidance. I will use several methods to make expectations explicit. First, I have included the project objectives and content standards that the projects will address. 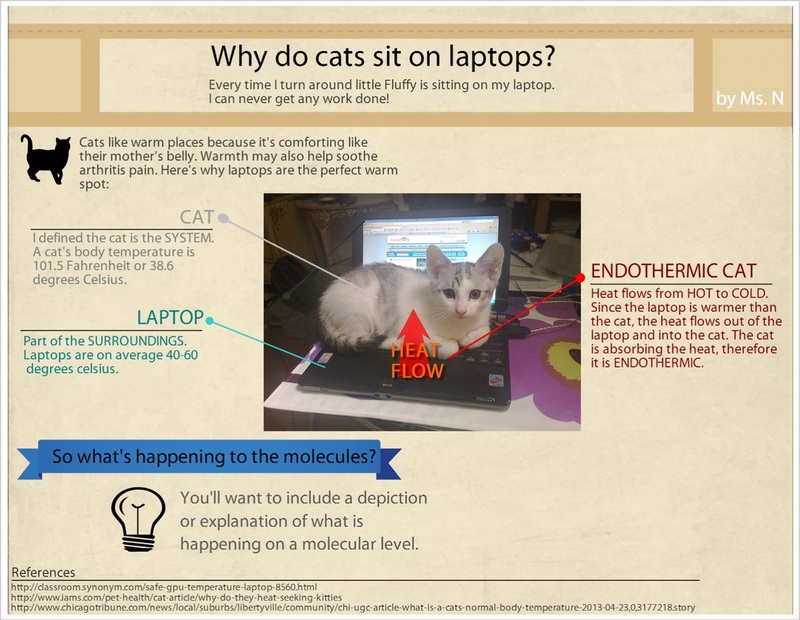 While creating their projects students will need to identify what in their process is the system and what is the surroundings; illustrate heat flow in their chosen system; categorize the process as endothermic or exothermic; and describe the motion of molecules on a molecular level. Second, I created a sample project (see below) so students have an example of a thorough product. Finally, I created a rubric for this project, which can be found here that will be used to score the projects. I created this rubric to guide students in what they need to include in their project with respect to content, organization, creativity, and references in order to demonstrate proficiency. This will both support making expectations explicit as well as allow students to self-assess their projects before turning them in. To create this rubric I used the articles on rubrics mentioned in my literature review as well as this guide for creating rubrics from the University of Connecticut. I used four levels: Advanced, Proficient, Emerging, and Incomplete. When I was following the U Conn guide for creating rubrics, there was a section that asked what the best and worst projects would look like, which I translated into Advanced and Incomplete. The Advanced level goes above and beyond, giving background, using a creative presentation medium, and using resources assessed to be reliable. Incomplete projects will have required content or structure missing and will need to be revised. The main difference between Proficient and Emerging is accuracy of content and clarity in expressing content knowledge. Teacher created sample project for student reference. This project will be completed by students individually. On the first day the project is assigned, students will decide on a topic and generate a question. I will be available to help students narrow down their choices, generate questions, and decide what type of media they will use to create their project. They can work on them in class when they finish the day’s activities and at home. Due to time constraints, they will not be required to give an oral project. The projects will be due in the class session before the unit exam. As my students progress through this project I mainly plan on collecting data measuring their engagement, motivation, and how this project affects their perceptions of science and science learning. From my literature review, I believe the element of choice will allow the students to engage more with the material by choosing a topic that interests them as their project focus and in turn be more motivated to work on the project as opposed to problem sets. I also believe that students may experience a transformation in their perceptions of science and science learning by seeing the application of science in everyday processes. To collect data on student motivation, engagement, and perceptions of science and science learning I will use three assessment tools: feedback forms, my own observations, and student work. I have created a Post-Project feedback form for data collection in Phase 1 (see below). This mostly assesses motivation and engagement with the project as well as student feedback for how to improve this type of project. The questions address the students' attitude towards having choice, what aspects of the project they found enjoyable (and were theoretically more engaged), if they were motivated to work on the project, and if they believe it helped deepen their conceptual understanding. I hope to use this feedback to inform Phase 2 of my action research. This form is anonymous so students are more comfortable sharing their honest thoughts about the project. There are two ways I will be taking observations. The first is with an observation guide which I have adapted from our seating chart. The observation guide will allow me to collect data on student engagement by tallying off-task behavior while students are supposed to be working on their projects. I will use three codes to describe off-task behavior: (C) on cell phone, (S) web surfing, and (OT) other off-task behavior. I also have a section for notes on the bottom of the chart to jot down student quotes or other observations. With this data I can see if students are more engaged than usual during the project and what sort of conversations they are having (if they are discussing chemistry or if talk is off-task). I will qualitatively compare the level of engagement in my observation guide with the previous engagement levels to see if having projects that students chose as interesting affects engagement. During the prep period following my two classes I will write reflections in my teacher journal. In these notes I will write down what I observed about student behavior, student comments, and generally flesh out my scribbles from the observation guide. These journal notes will mostly consist of my thought, observations, and questions that came up as the students worked on their projects. I will includes observations of motivation, engagement, and student interest. There will be two measures of student work that will provide additional data points for my research. The first is the completed student projects. I will be looking at the amount of effort that was put into the project, the depth of information, and if students met the project objectives. This is the first project the student will be doing in this class so there is no basis for comparison to previous work. This project will be scored using the rubric described above. The second will be exam scores. I will compare this unit’s exam scores to the previous unit to see if the student projects enhanced conceptual understanding compared to the worksheets that were used as assessment in the previous unit. 4/11-4/20 Students work on projects in class and at home. Collect observation data. 4/21 Projects due. Administer Post-Project Feedback form. 4/23-5/9 Data analysis. Design Phase 2. 5/12-5/30 Implement Phase 2. Collect and analyze data.